On one level it was an interesting and well produced programme – but on another it was naive and deeply flawed, exposing the familiar inability of traditional media to understand social media. The first flaw was the idea that social media only starts to become serious when it produces something that looks like traditional media. The artists and programmes featured may well be generating large audiences, but they none-the-less represent only a tiny fragment of the content or usage of the platform that is YouTube. It is of course this other usage of the platform, that The Culture Show did not feature, which is having by far and away the greater cultural, social and economic impact. But because this didn’t look like TV, it was ignored. This is a usage, incidentally, which YouTube itself is also ignoring, because you can’t easily grow advertising dollars within it. The second flaw was to assume that TV is a concept defined by its content. It is not, TV is a distribution medium, not a content medium. It has only come to be seen as a content medium because of the extent to which content has been imprisoned by distribution (media being message and all that). For the last 600 years, content has been in a loveless marriage with distribution and in this relationship distribution has worn the trousers. The demands of distribution channels (largely shaped by their expense) has dictated what content sits within them. This is why we call things ‘TV’ programmes not ‘video’ programmes – because TV is a distribution name, not a content name. But what things like YouTube are doing is breaking this relationship. Information (content) is being separated from distribution. This is, in effect, what the social media revolution is all about. Therefore when we ask “what is the future of TV” we now have to realise it has two futures: a (restricted) content based future and a (disempowered) distribution based future. The content future is defined by the fact that almost all of the content that currently lives on TV will move out and find distribution partners more suited to it – hence restricted. Here it will join a whole load of totally new types of content that hitherto have not been able to secure access to a distribution platform. The distribution future of TV will dictate that only content that is actually well adapted to TV as a distribution form will remain. This content will be stuff that only works well on an expensive, mass distribution, real-time medium – i.e. news, major live sports events and real-time mass entertainment and participation events (i.e. X Factor, Strictly etc. etc.). And even here much of this content will end-up being delivered across a range of distribution channels and by a range of distribution partners – hence disempowered (witness the recent BT Sport deal in the UK, where a telco is starting to become a ‘TV player’ – i.e. a distribution player). So – YouTube is not the future of TV. YouTube is the future of video content. And in this future, content will wear the trousers: it will be able to boss the channel, not the other way around. TV doesn’t really have a future as a content medium – only as (an increasingly bullied) distribution medium. In reality a better way of understanding the future is to define it by screen size and associated behaviours. There will be a big screen environment/behaviour, which we will tend to use when we want to feel part of an audience. There will be a desktop screen, which we will use when we want to behave as an individual. And there will be a palm-sized screens which we will use when it is not convenient to access the other types of screen, or for candy-content (short, sweet, usually consumed ‘to go’). We are also seeing, in Google glass, that there is a new screen based environment/behaviour – which I guess you could call the real-time, heads-up screen. And all of these screens will be fed by a variety of distribution technologies. 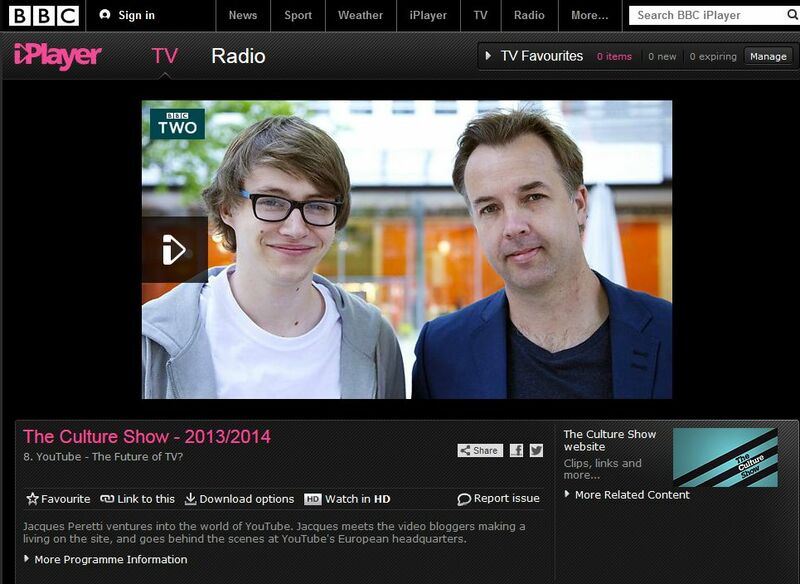 (Note: I watched The Culture Show on a desktop screen, using iPlayer, because no-one else in my family wanted to watch it, and it wasn’t necessary to view it as a real-time event). Useful Social Media: are they right about the top 12 issues you face this year?